Important advice. A sad case was a family friend who paid his son’s education through law school (out of his income as an ACT bus driver in the 1970s). The son broke off all contact after getting his J.D. because of their strong political differences. In this case the parent’s home had a lot of equity and allowed them to enjoy a modest retirement by selling it and moving to rural Nebraska. I suspect that they might have preferred Bay Area weather if they could have afforded to stay there. I know law school is expensive, but not expensive enough require a move from Bay Area to rural Nebraska. Maybe Bay Area to San Diego. Not sure if you missed that the parents are the ones who moved. It’s sad that the father who worked hard to put his son through school, lost all contact with him, let alone no retirement assistance. It’s sad, but not because of the finances. Financially speaking, the bay area is expensive enough that if you own a home in the bay area, you can slash 200k off the valuation and buy a similar house in most other parts of California. Unless “a lot of equity” is the price of the law school education. But if that’s the case, you’re in a bad part of the Bay and they’re better off in rural Nebraska. Sorry to get off topic, I’m done. Tuition bills come much earlier in life than retirement for 99.99% of America. It often comes earlier than mortgage completion as well. There is no one solution fits all, but expected timeframe of when you need to use savings is an important consideration. Yes, but you should be on the right path. If say you have a $750/mo contribution set up that puts on you on track for retirement, THEN you can start a $250/month contribution to a 529 or similar plan. I’m not saying you have to retire first before putting any money towards college. Scott think of it this way, if you are 30 and have a kid, they will be going to college in 18 years. You will be retiring in 30+ years. Thats 12+ extra years of compounding interest in a tax advantaged account for you and your family and eventually your child if you do well enough. Its much better than your child figuring out how to afford a nursing home or trying to fit you in their own home, there are programs for children to go afford college not so much for an elderly person to afford retirement. I would also add “contributing to an HSA” into the list. The triple tax advantages are awesome (no tax on contributions, no tax on earnings, no tax on withdrawals… As long as the money is used for medical/dental reasons). Primarily useful for youngsters or people who are generally in good health and aren’t expecting too much in healthcare costs. Great vehicle to start saving up for future healthcare costs. Some employers also contribute additional money on your behalf, and so that’s free money. It does require a high deductible health plan (HDHP). Agreed, Health Savings Account are a good option to consider if available to you. You’d want to have a cushion first in case you start the HDHP and immediately hit upon some big healthcare costs. Is prioritization between 4 & 5 just because of the increased range of options in an IRA as compared to a 401(k)? I would say prioritization between (4) and (5) depends on your marginal tax bracket. If you are in a high tax bracket right now, it makes more sense to max-out the 401K before contributing to IRA or backdoor Roth. If you are in a low income bracket and expect to be in a higher bracket in future, it makes more sense to contribute to IRA before maxing out 401K. It’s due to the portability to different brokers, the wide range of investments available across brokers, and the average 401k plan also has higher expenses and fees than what you could get in an IRA. The overall tax advantages are similar. You can usually roll a Trad 401k to Trad IRA and Roth 401k to Roth IRA eventually anyway. Between a Traditional and Roth, yes that depends on your current and future predicted tax brackets. Hi Jonathan, I’ve been a fan of your blog for ages! 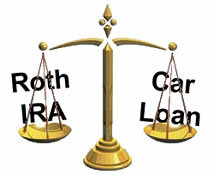 Do you know much about after tax 401k rollovers to roth IRAs? Basically contributing way more than you could before without the penalty. There’s been a lot of publicity about it, but I’m still confused why all the rules and regulations from the IRS. Maybe you could write a piece about it? Thanks! I’ve looked into what people call the “mega backdoor roth” and will write about it – thanks for the suggestion. The potential crowd that can use it seems small but it is worth a look if you have the extra money AND your employer allows additional after-tax contributions AND they allow in-service distribution otherwise the Roth conversion limits might come back. I do not have access to a HSA account at work, but have regular medical insurance from my employer. How do I save money into a HSA? Can I open one on my own through a service provider? Please advise. Thanks. #7 (HSA) should be #4. It is better than a roth + 401(k) since you can deduct the money going in and withdraw tax free coming out if used for medical purposes. If you have an emergency fund built (#3) the HDHP is less of a risk, and once you build a balance in the HSA a portion of it becomes a targeted extension of said emergency fund. I think there is an argument to move the down payment fund ahead of maxing out the post-match 401(k). The house is partially consumption but allocating some resources to a better today versus a better tomorrow isn’t unreasonable, especially if the matched 401(k)+ IRA (+HSA?) have already been funded. But you noted that is a question of personal priorities. One item not on the list that may apply to certain homeowners might be “”see if you can cancel your Private Mortgage Insurance””. If you bought a home with a conventional (non-FHA) mortgage more than 2 years ago with a down payment of less than 20 percent, you probably have a PMI policy. With a couple of years of amortization under your belt, and with home prices in most areas of the country rising smartly over the past few years, if your equity stake is now more than 20 percent, you might be able to cancel that PMI policy. Check with your servicer for details; this may or may not require an appraisal (~$450) which could negate a chunk of savings in the first year, but after that, it’s pure savings you can surely put to better use in any of the 1-10 items in the list.